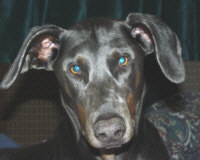 Animal Health Division of BioChemics Ears - My Lab has itchy ears? The good news is they are easy to diagnose and treat at home, the bad news is ear mites have 8 legs and travel. When you start treatment they move to a new area, usually at the base of the tail. When the ear medication wears off they return home to the ear canal.